The first trailer for the 2019 DC movie Shazam! was released at San Diego Comic Con, and it looks like a breath of fresh air compared to the darker tones of the other movies in the DCEU. This one has much more of a "Marvel vibe" to it, feeling like a superhero movie that won't take itself too seriously and wants to make the audience have a good time. Shazam is a rather unique superhero, as he is actually a boy named Billy Batson who has the ability to become a powerful, adult superhero known as Shazam. This helps to give a child-like tone to his comics and his movie, in addition to being able to have great fight scenes on the adult side of the scale. The tone of this movie should be unlike any other superhero movie we have seen before, carrying a unique narrative, and the new trailer only gets us more excited to see this clever concept on the big screen. Shazam moved along faster in development than most of the other DCEU movies that have been announced in recent years, which may actually be a good sign. The concept for the movie must have been great, considering how fast DC greenlit its production. It should be safe to say that this will be unlike any other DC movie we have seen released. Here is the official synopsis for Shazam!. "We all have a superhero inside us, it just takes a bit of magic to bring it out. In Billy Batson's (Angel) case, by shouting out one word-SHAZAM!-this streetwise 14-year-old foster kid can turn into the adult Super Hero Shazam (Zachary Levi), courtesy of an ancient wizard. Still a kid at heart-inside a ripped, godlike body-Shazam revels in this adult version of himself by doing what any teen would do with superpowers: have fun with them! Can he fly? Does he have X-ray vision? Can he shoot lightning out of his hands? Can he skip his social studies test? Shazam sets out to test the limits of his abilities with the joyful recklessness of a child. But he'll need to master these powers quickly in order to fight the deadly forces of evil controlled by Dr. Thaddeus Sivana (Mark Strong)." Shazam! 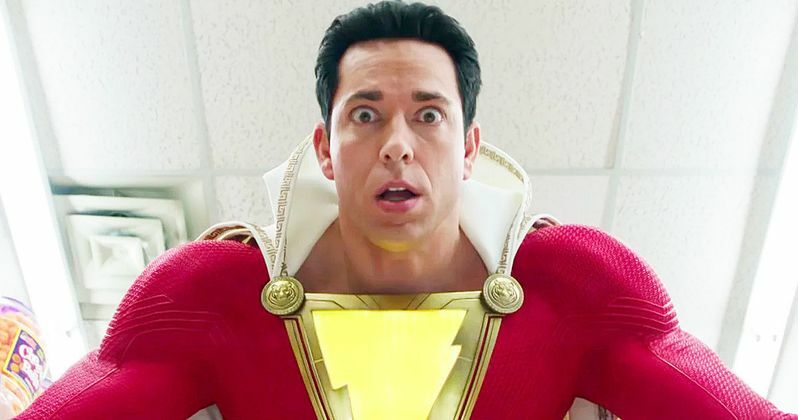 stars Zachary Levi in the form of adult Shazam. Levi previously appeared as Fandral in Thor: The Dark World and Thor: Ragnarok, so he's not entirely new to the superhero genre. However, this is the first superhero movie that he is the star of, so this is certainly a big step up for him. The movie also features Mark Strong, Djimon Hounsou, and Asher Angel. Based on the looks of the latest trailer from Warner Bros, Shazam! will not be a movie that superhero fans will want to miss. Marvel and DC fans alike are sure to be pleased with this unique adventure, which will perhaps start a new leaf for the rest of the DC Extended Universe. You can watch the trailer for yourself below, and be sure to see Shazam! when it hits theaters on April 5th, 2019.